When I rust dyed fabrics last summer I threw in a few vintage linens and crocheted pieces. This started life as one of 4 corners probably intended for a lunch cloth. I backed the crochet with rust dyed muslin and thin cotton batting, lightly stitching them together. I accented the crocheted rose with embroidery floss and then encrusted it with seed beads. It sat for some time waiting patiently for me to finish it. Today I found a hammered copper concho belt which added just the right amount of hard to offset the soft. I used some of the copper links from the belt as carriers to attach it to the copper neckband and used one medallion as the pendant. 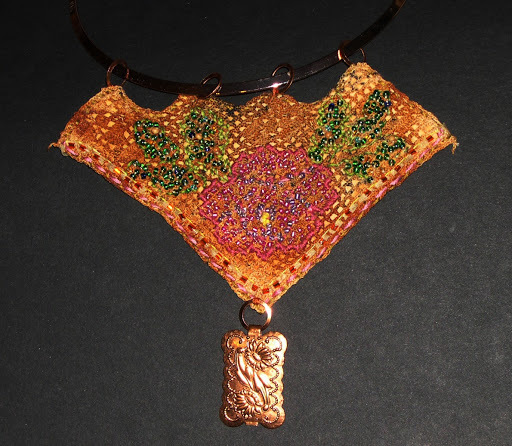 I’m please with how this came out and I am anxious to work on the other rust dyed linens and other art quilt jewelry. I would like to sell these in an Etsy shop or I may keep them to jury for the Arkansas Artisans Guild in the spring. Of course that means I have to set a price…..any ideas? This piece is really lovely. I think the addition of the copper is just the right touch. The only part that I would change would be to get rid of those threads at the corners. They detrack from the clean finnish of the piece. Beautiful work! ooops……you aren't supposed to see those threads…I don't have the final backing of ultra suede on it which will encase all of them. I was anxious to see if it would photograph! Janice – what a gorgeous piece. You have so many talents! I would find it extremely difficult to set a price for this type of work – it is apparent that you've spent a lot of time and thought in creating it. Super job! This is lovely. I saw crocket necklaces out of wire and semi precious stones + glass beads sell for $200 – $600 in a small art gallery in Florida. The catch is that this is a know place for art work so people make this art colony a 'go to' place on vacation. I of course do not have the $$$ to buy, but I did see pieces sell when I was there. Etsy is another matter. How about the new art network. Beautiful piece! amazing what those 'found' fabrics and items can be used for. Just lovely! Janice – this is beautiful. I have a zillion crochet pieces, samples that I have done over many years before going the quilting route – never in my mind would I have thought of doing something like this with them. What wonderful gifts they would make (I don't sell), but love making for others. Thank you so much for this idea to work with. Is the copper neckband from the belt? Does it have a closure, or just work like a neck cuff? It is utterly gorgeous! There is a closure, it is sort of a keyhole thing on the neck cuff. Personally, I wouldn't close it since it fits tightly without it.